SIMMS: Coming from the West, do you think you have any advantages over anglers from other parts of the country? Hite: Our advantage as Western anglers is our versatility. You look at what a bass pro is today versus 25 years ago, those are two different guys. The versatility in our Elite Series schedule has made it so anybody who’s consistently successful has to be versatile. You can’t just flip all the time; you have to be able to finesse fish, you have to know how to catch smallmouth, you have to know about tidal fisheries. It’s not just a one-dimensional deal anymore. Those tidal fisheries like the Delaware River or Chesapeake Bay, I look at how fish position themselves on different stages of the tide because of my experience on the California Delta. Every tidal fishery is a little bit different, but there are some key characteristics that make them similar, and I learned all about that in the Delta. I think just by fishing out West, we have experience on so many different kinds of fisheries. We have shallow grass, we have deep, cold, clear lakes, we have tides. We’re able to fish a little bit of everything. SIMMS: Does that also translate into the baits and techniques you use? Because there are a handful of extremely effective techniques that came from the West Coast. Hite: Oh, absolutely, the best example is the drop-shot. I started using that around 1999, and I know Aaron (Martens) was using it around that time, too. The drop-shot didn’t go crazy until probably the mid/late 2000s, but we’ve seen that technique evolve. We started with a tiny nose hook, fishing it vertically – Aaron and I were out there with 6-pound test, a trout rod and a tiny little nose hook. Now I’m fishing a drop-shot with a heavier rod with a Texas-rig style hook, fishing it for largemouth a lot more than I did when it first started out. The Neko rig is another technique that started out here in the West and has flooded the rest of the country. It’s not some secret new thing, it’s been a stable on the West Coast for 15 years. The Neko rig really busted loose the last few years at Kentucky Lake, but as far back as the early 2000s, guys were winning boats out West on a Neko rig. SIMMS: If we’re going to talk about baits, we almost have to talk about the chatterbait. You’ve won several Tour-level tournaments on that bait. What is it with your ability to catch big fish on a chatterbait? Hite: I guess I just know the recipe. Plus, I just throw it a lot. If those fish are in the upper water column and want a reaction bait, I know they’re going to bite a chatterbait. There’s something about it that seems to trigger those bigger fish. Plus, you can fish it a lot of places where you can’t fish other reaction baits. For example, before the chatterbait, if we went to the Harris Chain or Toho, guys would throw a Rat-L-Trap; that was just your reaction bait if you were fishing grass. If the grass is kinda topped out, though, you can’t fish a Rat-L-Trap – but you can sure as heck can throw a chatterbait. It has a similar deflection as a squarebill, but you can’t skip a squarebill 20 feet under a dock. With a chatterbait, you’re getting that style of reaction bait into places you could never get it before. SIMMS: What is it about the construction of the bait – and specifically the way you rig it – that works so well? Hite: Well, just look at the bait. The blade makes it vibrate like a Rat-L-Trap – it has a tight vibration, which bass love. With the trailer, I’ve added the swimbait profile to the bait, and fished that places where it’s never been fished before as well. So you have the vibration of a Rat-L-Trap and the profile of a swimbait, which is a pretty tough combination to beat. 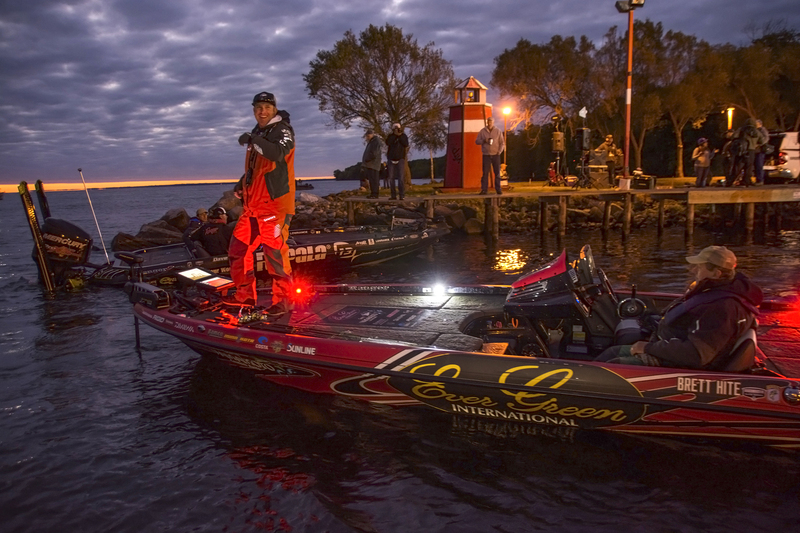 SIMMS: How about the way you break down a new fishery? Is the way you do it different than other guys? Hite: I know a lot of guys like to just drive, drive, drive; they’ll cover an entire lake in practice, just trying to see as much of it as they can. If I’m on a new lake where I don’t have any history, I prefer to pick one area of the lake the first day of practice and focus on that. I’ll do some map study and try to find an area that has a lot of different features, and stay in that area for one full day, trying to figure out whatever pattern I can. If I find a pattern, I’ll then try to duplicate that in a different area the second day of practice. Lake Conroe is a small lake, so it won’t take long to cover most of that in practice. A giant lake like Toledo Bend, though, I’ll just focus on one giant creek arm one day, and then go fish a different creek or a different end of the lake the next. Whichever of those two creeks I think is better, I’ll go back to it and expand on that area on the third day. Once you’ve put all the pieces of the puzzle together, you have a lot of good spots in just a couple of areas, instead of having one spot here, one spot 5 miles up the lake, one spot 10 miles up the lake, etc. I just prefer to be more efficient with my spots instead of running around like a madman. SIMMS: What’s your gut on Conroe? Do you like that lake? Hite: I’ve never even seen it. My first day of practice for the Classic will be the first time I’ve been on that lake. I know some things about it, though. I know that they’re going to be in the upper water column this time of year. They’re not going to be out in open water, 25 feet deep. I’d say that 95 percent of the fish caught will be caught from 1 to 10 feet deep. There’s a lot of manmade structure in that lake – lots of of docks and seawalls and such – and as you go further up the river it’s more stumps and standing timber. I’m going to fish shallow. You’ll see me with some kind of finesse bait in my hand, a Jackhammer (bladed jig), and a topwater. And I’m going to keep my eyes open for a big one laying on a bed. 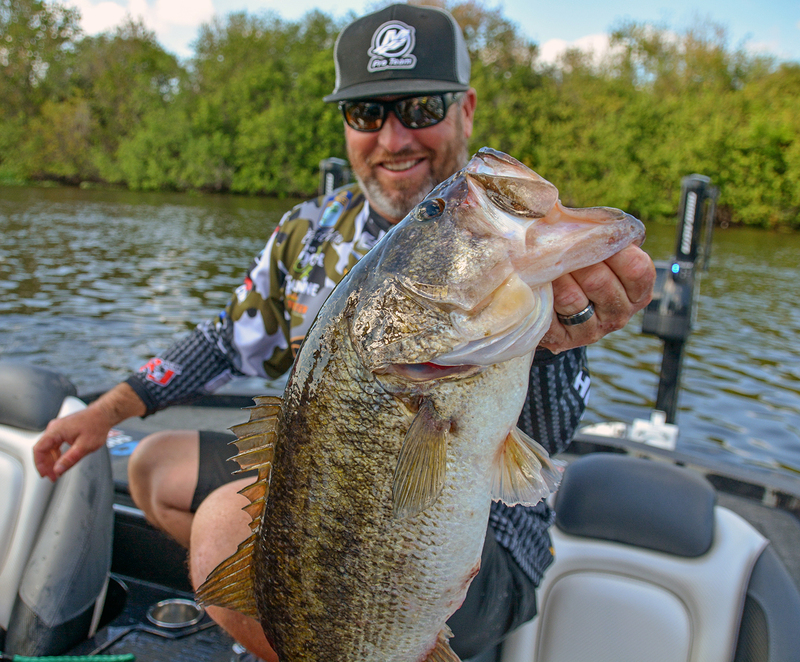 Topic(s) Bassmaster Classic, Brett Hite, Simms Fishing by Joel Shangle. Bookmark the permalink.